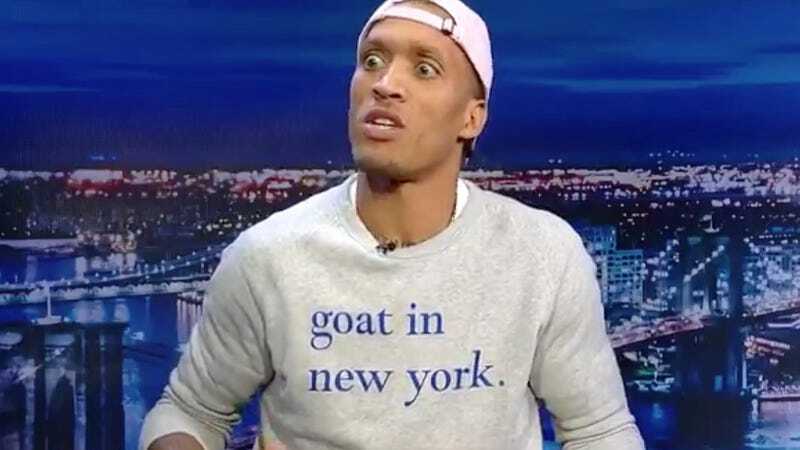 Michael Beasley is new to New York. Already he has said that he is “your favorite player’s favorite player” and that he, at 28, can still be “one of the best in the NBA.” Slow your roll, Beez. There are at least two more reasonable goals for you to achieve first: starting small forward(???) for the Knicks, a thing we might actually see; and premier Fake-Deep Guy in the NBA, which he made a strong claim to in a chat today with Taylor Rooks at SNY. If you look up right, you can research the human brain and [garbled] right? It says that we are only capable of using 10 percent of our brain. You believe that? It’s the consensus scientifically. So who was the guy that used 11 that made it okay to say that everybody’s just using ten? Because if you’re only using 10 percent of your brain you don’t even know that you’re using 10 percent of your brain. If you’re only using 10 percent of something that means you don’t know the rest of the 90! You can’t sit here and tell me that I can only use 10 when you can only use 10. Because in order to see the number 10, you have to pass it to 11 and look back. You know what I’m saying? All I’m saying is the words that we use are concocted by someone who thought a hammerhead shark should be called a hammerhead shark just because it looked like a hammer we invented. We don’t know the actual term, the actual word, the actual definition behind the words that we use. Dang, Beez! If this argument wasn’t being used to advance the idea that “we don’t know” what the n-word means, you could say Beasley was making a good point about how meaning of words is socially constructed and imprecise and maybe words could misrepresent some aspects of the underlying reality they seek to describe. Either way, I’m putting a wristwatch around my ankle as we speak.